Extraordinarily lovely. A wonderful job both scientifically and artistically. Specail Offer! 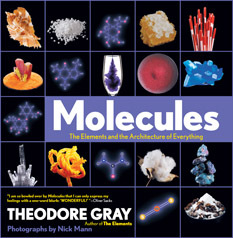 Nearly ten years in the making, my trilogy of books—The Elements, Molecules, and Reactions—are together the ultimate gift for anyone who is curious about the world. In celebration of this fact, and the fact that you know someone just like that, we are offering the complete set at a special price, with free giftwrapping. 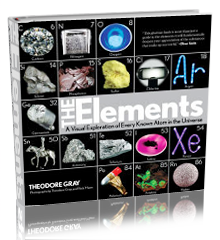 As an added bonus you get a dozen copies of our not-available-any-other-way periodic table postcard (to send to all the people who aren't getting the books from you). These posters are printed on the highest quality paper available, using the sharpest available sheetfed presses. Stochastic dithering (instead of conventional halftone screening) results in a razor-sharp image. Frankly I was amazed when I saw the first sheets off the press: I didn't know it was possible for mass-production printing to look this good. Click the pictures to the left to see larger versions that simulate roughly the detail visible in the largest version of the poster. The 27" x 53" version is almost four and a half feet wide: Imagine you had a 60" (diagonal), 250 dpi monitor and that should give you an idea of what the poster looks like in person. Every element has a pretty side, and in this poster I have tried to give each one a chance to show off what makes it unique and beautiful. For example the noble gases are represented by discharge tubes that display their characteristic colors in an electric arc. 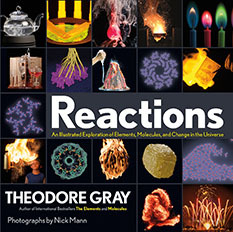 Iodine was photographed while being heated from below to bring out the distinctive and lovely purple vapor it gives off at elevated temperatures. Niobium is represented by an ultra-high purity crystal ribbon, an attractive form that few people have ever seen. Silicon, in contrast, is represented by a relatively low-purity sample, but one that is just plain good-looking. They've arrived! They look amazing, much better than any periodic tables I have seen elsewhere. Oh My God, the periodic table posters made Keith's birthday an event. He couldn't be happier. 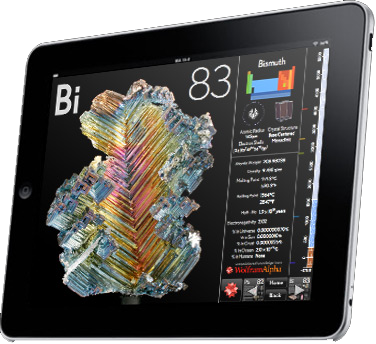 Your periodic table is instructive and fun. I have put it up in my office. It's simply amazing. Beautiful, elegant and very high quality. Even my wife who's not very keen on this kind of "science" stuff is very pleased for the beauty of it alone. The posters were received and are more beautiful in person than I imagined! 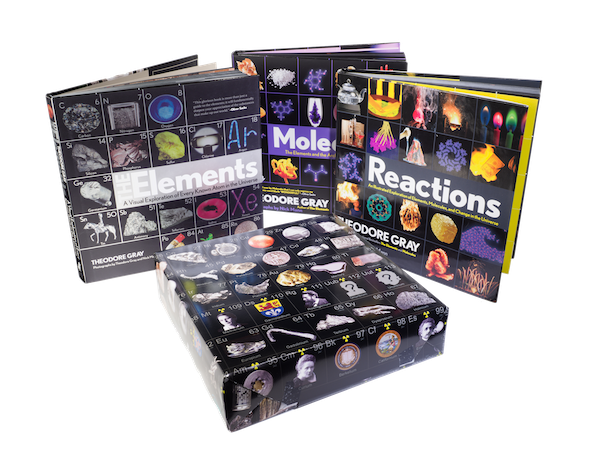 Very exciting for many of the teachers I work with that are currently being held captive by their outdated, boring periodic tables. My poster has generated countless blog posts from slashdot on down, articles in my local newspaper, a news item in the American Chemical Society's Chemical & Engineering News, etc. 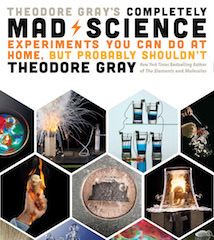 But the most dramatic gesture is the publication in Popular Science magazine (December 2006 issue) of a three-page tear out special edition of the poster, along with a page describing my element collection and the making of the poster. Of course even a three page centerfold is only about as big as the 10" x 20" place mat I sell here, and magazine printing and paper are nowhere near as good as what you get if you order one here. But on the other hand, they printed 1.4 million copies of it, allowing a huge number of people to see just what they've been missing in the regular periodic table. When I installed a 33-foot wide version at my old High School the newspaper wrote about it again. It's also been featured (which is to say, it's visible on the wall behind the actors) on two TV shows, MythBusters on Discovery channel and Hannah Montana on Disney Channel.